Contact <kathleenkrasity@yahoo.com> to reserve by June 11. Payments to be made by check before the dinner. The Beaubien Rooftop Garden also hosts much needed pollinators. Honey, produced by the garden’s bee hives, is sold it in the Renaissance Center’s holiday shops. Proceeds from the 150 jars supported a warming center. 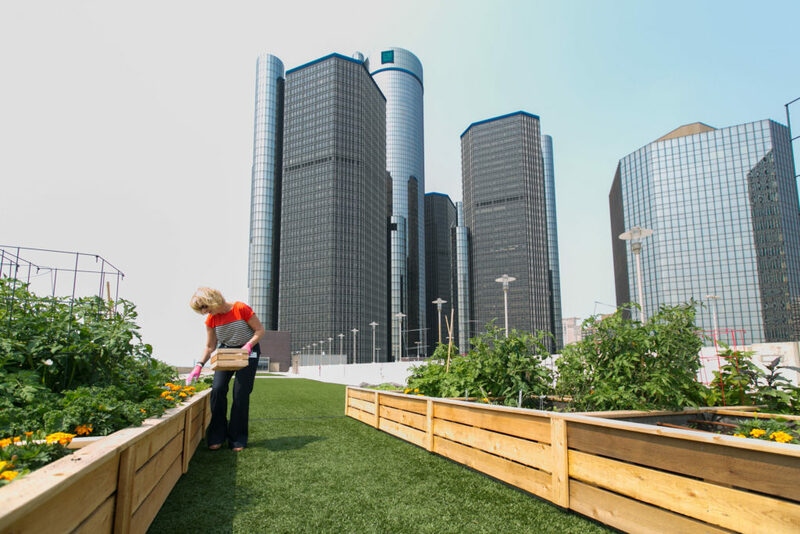 Since Detroit’s Riverfront is on a direct monarch butterfly migration path, GM has planted milkweed plants to create three certified Monarch Waystations. In late summer, RenCen employees and children from the building’s daycare gathered to release colorful orange monarchs butterflies. Dinner at Andiamo includes salad, breadbasket, main course of chicken marsala chicken parmasean, whitefish, or vegetarian pasta, and raspberry sorbet for dessert. Beverages are not included. However, Andiamo offers half off wine on Wednesdays. The Tour starts at Beaubien Place Garage, 238 Beaubien St, Detroit. You may wish to park there, standard fees apply. Valet parking is also available at Andiamo Restaurant, on the river side of the RenCen. Car pooling encouraged.